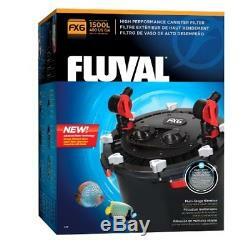 FLUVAL FX6 CANISTER FILTER EXTERNAL FILTRATION MEDIA FISH TANK AQUARIUM MARINE. 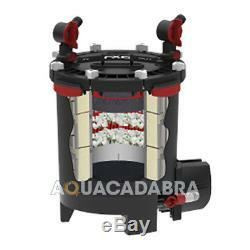 Super capacity yet compact canister filter The FX6 circulates and filters&###xA0;3500 litres (925 US gallons) of water an hour and has an astounding filter media capacity that produces the cleanest and healthiest results ever. Filtering media can easily be placed in a removable stack of media baskets which is at the heart of Fluval&###x2019;s multi-stage filtration. The baskets are precision-engineered to eliminate water by-pass, making filtration more efficient. The baskets can hold a total of 5.9 litres of media and can be stacked in the precise combination of layers that will work best for your aquarium. Each one is lined with a foam insert for effective mechanical pre-filtering. Instant-release T-handles let you lift and separate the baskets quickly and easily, making routine maintenance simpler. Even better news, Fluval FX6 comes with all the essential filtering media to provide complete and effective filtration immediately. Enhanced motor technology Improving on Fluval FX5, Fluval FX6 is powered by a more efficient motor, which provides better performance while consuming 10% less electricity than its predecessor. Intelligent pump Like FX5, Fluval FX6 also features Smart Pump Technology, an advanced technological feature that continually monitors the pump, constantly measuring impeller speed and force to ensure powerful output and energy efficiency. It also manages the filter&###x2019;s self-starting feature and evacuates air that may enter or build up within the filtration system. On a 12-hour cycle, the pump will pause and allow trapped air to escape, ensuring the best filtration efficiency at all times. Easy installation and maintenance Like all previous FX Filters, FX6 comes with all the user-friendly features that have consistently put FX aquarium filters at the head of its class when it comes to installation and maintenance. To make maintenance easier, FX6 has two maintenance dials, which allows you to remember when you last performed maintenance tasks. Only 54 cm (21&###x201D;) in height, Fluval FX6 fits under most aquariums. 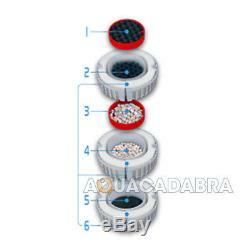 For Aquariums Up To: 1500L. Mechanical Area (Foam): 325.5 In2 / 2100 Cm2. : 10.8ft 3.3 M.
Wattage: 240 V/50 Hz: 41 W. Unfortunately couriers pass on aditional shiping charges for these locations which we have to pass on. There are many reasons to shop online with Aquacadabra. We feel that offering a large inventory of products at competitive prices, tied to a high level of customer service and the reassurance that we are available for you 6 days a week for any fishy questions that you may have, Aquacadabra is the one stop shop for all of your aquatic reptile or pet needs. If an item over the specified value/weight is ordered to one of these locations, you will be subject to a &###xFFFD;6.90 surcharge from our courier. Our website features an extensive online Help section which covers all eventualities with orders; together with easy to complete forms to enable us to address any problems in as quick an efficient a time frame as possible. The item should be in an unopened and unused condition and you should notify us within 14 days that you wish to return the item to us. Please be aware that after bank holidays there is always a back log of orders for us to work through. Usually this is due to a courier being unable to locate an address, and unfortunately problems can from time to time be encountered when using any third party courier service. Please note that should a parcel be lost it takes 14 days before we can claim for the lost parcel. We will discuss the matter directly with you to ensure that you receive the minimum of inconvenience. This listing is currently undergoing maintenance, we apologise for any inconvenience caused. 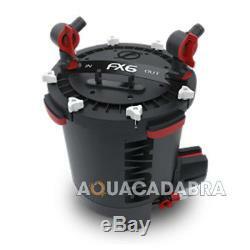 The item "FLUVAL FX6 CANISTER FILTER EXTERNAL FILTRATION MEDIA FISH TANK AQUARIUM MARINE" is in sale since Friday, March 01, 2013. This item is in the category "Pet Supplies\Fish & Aquarium\Filters". The seller is "aquacadabra" and is located in bexleyheath,kent. This item can be shipped to United Kingdom, United States, Japan, Canada, Ireland, Australia, Germany, France, Greece, Italy, Spain, Russian federation, Austria, Belgium, Bulgaria, Croatia, Cyprus, Czech republic, Denmark, Estonia, Finland, Hungary, Latvia, Lithuania, Luxembourg, Malta, Netherlands, Poland, Portugal, Romania, Slovakia, Slovenia, Sweden, Brazil, New Zealand, China, Israel, Hong Kong, Norway, Indonesia, Malaysia, Mexico, Singapore, South Korea, Switzerland, Taiwan, Thailand, Chile.